Sleek and modern look with advanced touch screen menu. Take the guesswork out of cooking with the built-in touch screen menu featuring 8 cooking presets: Fries/Chips, Pork, Chicken, Steak, Shrimp, Cake, Fish, and Pizza. 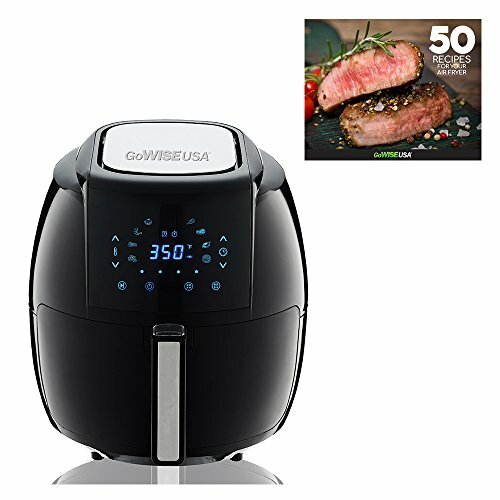 Equipped with a wide temperature range from 180F to 400F in 10 degree increments and a cooking timer up to 30 minutes. This XL fryer can feed a family of 4 and more. Featuring a new Start/Stop button to change time and temperature in the middle of a cook cycle. Don't forget to shake with the new built-in alarm function that reminds you to shake your ingredients in 5, 10, 15 minute increments. Comes with non-stick FDA-certified and PFOA free pan and detachable basket equipped with a cool touch handle and button guard to prevent accidental detachment. Shake and flip contents in the middle of your cooking program with the detachable frying basket. If you have any questions about this product by GoWISE USA, contact us by completing and submitting the form below. If you are looking for a specif part number, please include it with your message.